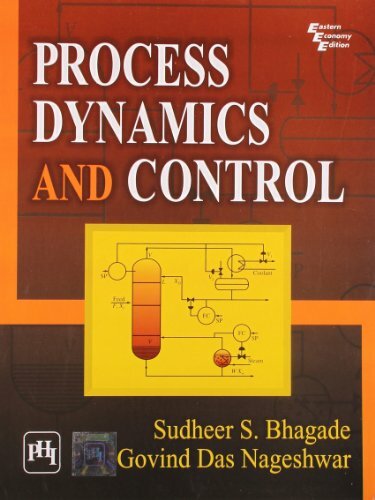 This well-organized and comprehensive book presents the basic concept and terminology of process control citing examples from day-to-day life. The text discusses the order of dynamic elements and their responses, transportation lag, block diagrams, final control elements, controllers, the concept of stability, techniques to tune controllers, etc. in detail. It also explains the way the elements are put together to form a loop and their interactions to each other, Ziegler-Nichols and Tyreus-Luyben controller settings, and a host of other topics that help students understand the control configuration. Primarily intended for undergraduate students of chemical engineering, this text can also be useful for undergraduate students of electrical and mechanical engineering. KEY FEATURES: Provides examples of several dynamic elements from chemical industry. Includes a large number of diagrams illustrating the control action to be implemented. Gives examples of dynamic elements from chemical industry to correlate functioning of equipment from control point of view. Deals with both electronic and pneumatic controllers. GOVIND DAS NAGESHWAR, PhD, has been former Director of Laxminarayan Institute of Technology, Nagpur (Maharashtra) for several years. He has over 50 years of teaching experience at both undergraduate and postgraduate levels. Dr. Nageshwar has lectured at Pardue University, USA, and has carried out research work in France and USSR under exchange programmes. He has published nearly 100 research papers in national and international journals of repute, and has authored two books. He is the fellow member of the Institution of Engineers (India). In 1995, he won the best teacher award instituted by the Government of Maharashtra. SUDHEER S. BHAGADE, PhD, is Professor, Department of Chemical Engineering, Anuradha Engineering College, Chikhli (Maharashtra). Earlier, he served as Professor in the Department of Chemical Engineering, Laxminarayan Institute of Technology, Nagpur. He has over 40 years of experience in teaching at both undergraduate and postgraduate levels. Dr. Bhagade has published nearly 30 research papers in national and international journals and conferences. He was conferred Emeritus Fellowship by All India Council for Technical Education in 2005. His areas of research interests are novel catalyst for reactions, alternative sources of energy, microwave reactions, chemical databases, and so on. Editore: PHI Learning Pvt. Ltd.